Never forget your gear again! 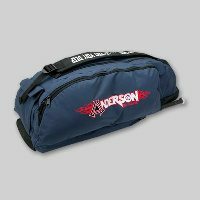 The Anderson Free-Style Bat Bag is for the serious ball player who needs a bat bag that lasts. This heavy duty bag holds five bats, four in a zip able compartment and one in the bat sleeve on the outside. There are thirteen compartments to hold all your essential gear, including a pocket for your glove, a lined pocket for sunglasses, and a cell phone pocket. There is even an isolated pocket for your cleats that will keep the rest of your gear from getting covered in dirt. The new Anderson Bat Company Free-Style logo is embroidered on one of the many side pockets. This athletic bat bag is made of 600d nylon with a 1/2 foam cushioned bottom to protect all your gear inside. There are two heavy duty hooks to conveniently hang this stylish bag on any fence. The thick and sturdy shoulder strap makes it easy to carry your bag to and from the field and is embroidered with Andersons company motto: "GO DEEPGO VERY VERY DEEP." The bottom of this 12x10x36 inch bag is tagged with the Anderson Bat Company logo to show everyone what you are about to unload. Bring your "A" Game and GO DEEP with the Anderson Free-Style Bat Bag. There is a removable embroidery panel that you can send in to have your name, your team name, and your number custom embroidered on.